*Student and/or school is responsible for all costs associated with attendance in All State: $20.00 audition fee, $30.00 participation fee if accepted, transportation, lodging and meals when attending the actual event. 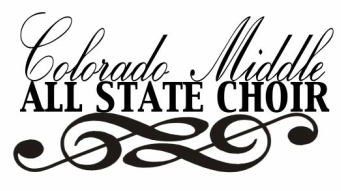 The audition and participation fees go towards CMASC operating costs including: renting the rehearsal and performance venue, paying honoraria, travel and lodging for guest clinicians, paying accompanists and guest musicians, etc. UPDATED INFORMATION ON AUDITIONS AND REGISTRATION WILL BE POSTED ON THE "AUDITION INFO" PAGE IN AUGUST 2017!